Synthetic Cannabinoids – How do they differ from the real thing? Synthetic cannabinoids are generally sprayed on dried, shredded plant material so they can be smoked or sold as liquids to be vaporized and inhaled in e-cigarettes and other devices. They bind to the same receptors that cannabinoids from the cannabis plant bind to but often get labeled as not safe for human consumption for liability defense. Unlike regular cannabis, the synthetic stuff has addictive properties. 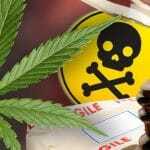 There are no fatal overdose cases linked to cannabis but deaths associated with synthetic cannabinoids are increasing. With a wide range of negative side effects including anxiety, palpitations, paranoia, vomiting, nausea, confusion, and seizures, this stuff is definitely worth staying away from. To date, there have been a few scientific studies on the effects of synthetic cannabinoids on the human brain, showing some of them bind more strongly than natural cannabinoids to the cell receptors, and can produce much stronger effects. The resulting health effects can be unpredictable and dangerous. When individual molecules are extracted and consumed as an isolate, they are far less potent that less refined whole plant extracts. Cannabinoids have an amazing synergistic effect and work together to produce incredible health benefits through the entire body. Single cannabinoids alone are not only less potent but they can also create unwanted side effects that nature did not intend. CBD forexample reduces the high and anxiety effect high THC can cause while THC helps the absorption of CBD.